Born in 1929 in a rich family of merchants, Kusama knew she wanted to become an artist ever since she was a child. Her mother, however, thought otherwise and did everything in her power to suppress her daughter’s creative ambitions. Kusama’s mother, a strong-willed woman in charge of the family business, used to beat young Yayoi and tear apart any drawing she dared produce. Her brothers were not of much help either. They advised her to collect rather than produce art, as that is where money is made. In her essay “Why Do I Create Art?” Kusama described her youth as “truly miserable… I was an unwanted child born of unloving parents.” Fortunately for her, young Kusama was born as hardheaded as her mother. In response to the latter’s abuse, Yayoi took refuge in an ever greater production of paintings and paper cuttings. Kusama’s use of repetitive, seemingly endless patterns of polka dots may aesthetically be very pleasing, but is the result of a rare mental disorientation. Ever since she was a child, the artist has suffered from severe hallucinations. One day at the age of ten, Kusama was staring at a tablecloth’s red flower pattern. The moment she looked up, the flowers had also appeared on the ceiling, the walls and even on her own body. “I felt as if I had begun to self-obliterate, to revolve in the infinity of endless time and the absoluteness of space, and be reduced to nothingness,” Kusama once said. To her, this was not a simple trick of the senses, but something actually happening. Frightened, she ran up the stairs in an attempt to escape from “the spell of the red flowers.” In her haste to run from danger, she fell and injured her ankle. Such hallucinations continue to haunt Kusama to this very day. She believes her disorder is the result of the verbal and physical abuse she suffered as a child. However, she has learnt to live with her condition, whereby art serves as a kind of therapy, a way to act out her fears. “If it were not for art, I would have killed myself a long time ago,” Kusama wrote. While she has worked with all sorts of media, the infinite networks of polka dots have been a constant factor in her artistic career. A spectator stepping into Kusama’s dotted fairytale spaces also enters the artist’s inner world and somehow relives the loss of self she experienced as a child. According to Kusama, the polka dots symbolize disease, the reoccurrence of phallic symbols reflects sexual fear or obsession, while the nets symbolize the infinity of the universe. Despite her family’s objections, Kusama entered the Kyoto School of Arts and Crafts in 1947 and had her first show in 1952. She received good reviews, not only by art critics, but also by psychiatry professor, Shiho Nishimura, who introduced her work at academic conferences and advised her to move away from her abusive mother. In 1957, Kusama traveled to the US, where she rapidly became a hit in the avant-garde art scene dominated by Andy Warhol. During the roaring 1960s, the years of “no war,” sexual revolution and “power to the people,” Kusama continued to work with nets and polka dots, but also experimented with several kinds of media, including film and photography. In a rare interview with Bomb Magazine, Kusama said that the New York police were never much trouble. They were just after a bribe. When she was directing the Wall Street happening and taken into custody, the police demanded she paid them to be freed. Bribes ranged from $400 to $1,000. “Since I paid them every time I was arrested, my happenings ended up as a good out-of-the-way place for them to make money,” Kusama said. Another work, “Air Mail Stickers,” which consists of over 1,000 of post office seals pasted on canvas, greatly influenced Andy Warhol. For a few years, Kusama was in fact more famous than Warhol, before falling out of fashion in the early 1970s. Penniless, ill and forgotten by the Big Apple’s art scene, she traveled back to Tokyo, where she has voluntarily lived in an open mental institution since 1975. The life Kusama now leads is one of a sharp contrast with the wild New York years. Every morning she wakes up and walks to her studio, located just around the corner. She heads back to the hospital for lunch, returns to the studio, and then walks back to have dinner and sleep. “It’s very comfortable, very private and very simple. I like it,” the 89-year-old artist said. In addition to producing art, Kusama took on writing in the 1970s. Since then, she has published more than a dozen books, including her award-winning The Hustlers Grotto of Christopher Street. Meanwhile, as she quietly lives her life between hospital and studio, her art has traveled all over the globe, as an increasingly curious art world has gradually rediscovered and embraced her work. 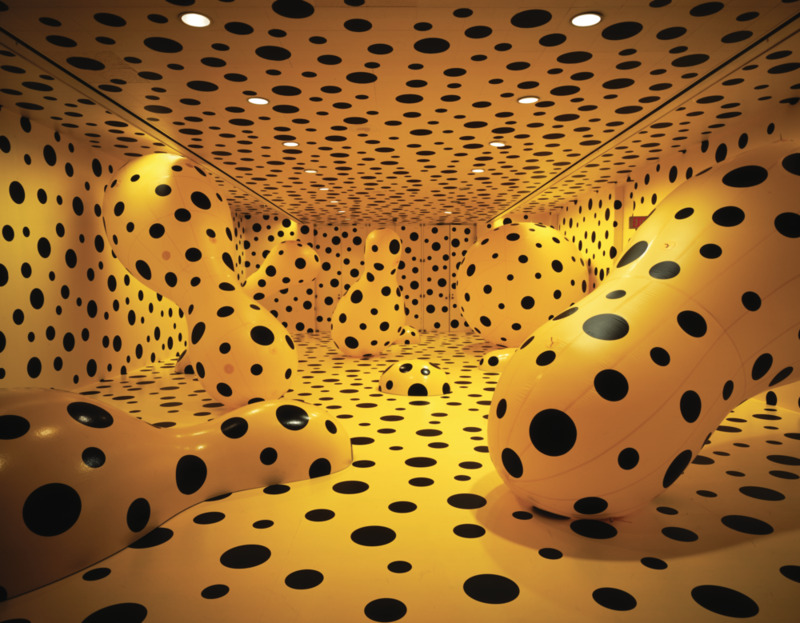 Kusama has had major exhibitions all over Japan, Europe and the US. In 2004, her solo exhibition at the Mori Museum in Tokyo drew no less than 500,000 visitors. One of the most personally satisfying shows must have been the retrospective at MOMA, the Museum of Modern Art. 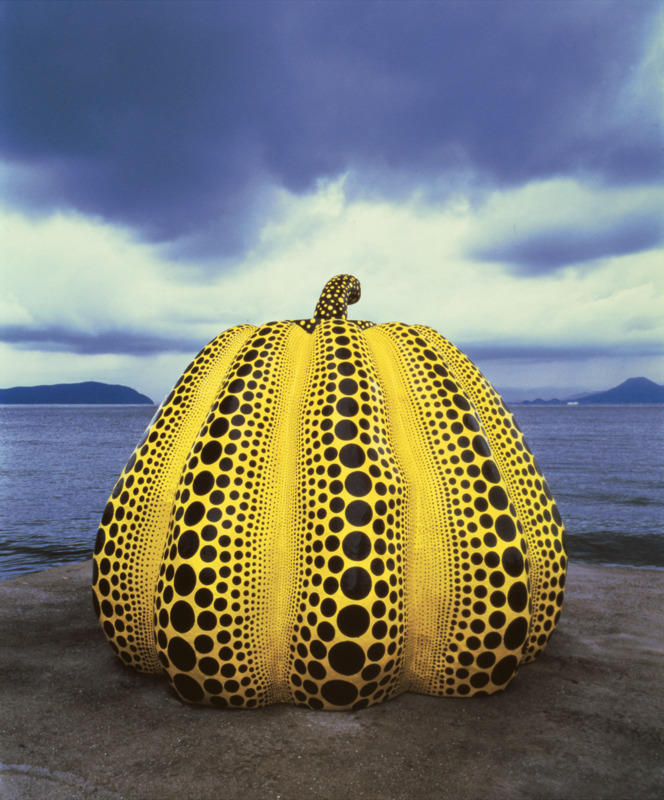 Kusama was also asked to produce giant open-air structures in Japan, France and Portugal. As always, with the recognition come the awards. Since 2001, Kusama has received numerous medals, ribbons and the Praemium Imperiale, Japan’s most prestigious art award. She was, in fact, the first woman ever to do so. Today, Kusama is at the top of her fame. Better late than never, one would say. It has been a journey against all odds: from beaten child to New York starlet; from forgotten patient to one of the world’s most respected living artists. God knows she deserves it.